Don't Be Fooled By New York; Gun Control Faces Long Odds In States, Too : It's All Politics If you didn't know any better, you might think that even if new gun control proposals from President Obama become stalled in Washington's gridlock, the states will rush in to fill the void. A few states might, but don't expect a national trend. New York Gov. 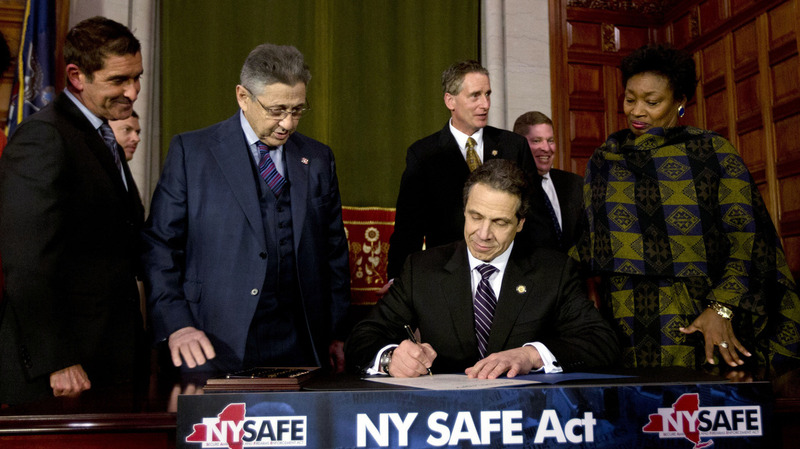 Andrew Cuomo signs New York's new gun-control law Tuesday in Albany, N.Y. If you didn't know any better, you might think that even if new gun control proposals from President Obama become stalled in Washington's gridlock, the states will rush in to fill the void. After all, under its Democratic Gov. Andrew Cuomo, New York has responded to December's Newtown tragedy by passing legislation banning assault weapons and making it harder for seriously mentally ill individuals to legally obtain firearms. Meanwhile, Maryland Gov. Martin O'Malley, a fellow Democrat, has announced that he is championing new restrictions to require anyone seeking a gun permit to take a mandatory training course and submit fingerprints to state authorities. And yet one more Democrat, Gov. John Hickenlooper in Colorado, a state in a traditionally pro-gun region of the country, is calling for universal background checks for would-be gun purchasers. He would require anyone buying a firearm, even at a gun show or in a private sale, to pass a criminal background check. There's an old newsroom adage that three is a trend. And the activity in these three states could certainly lead an observer to assume that there's a widespread movement in the states to act on gun control with a swiftness not found at the federal level. But sometimes three doesn't really signal a larger trend. This is one of those times. While the three aforementioned states and several others are considering new restrictions on guns following the pre-Christmas massacre of grade-schoolers and educators in Connecticut, there isn't much evidence of things on the state level shifting toward greater gun control. The states considering further restrictions are all blue states. In fact, in several red states, the shift is in the exact opposite direction. In Arizona, Tennessee, Texas and Wyoming, for instance, legislation has been introduced recently that would loosen gun restrictions or underscore gun owner rights. While the gun control issue isn't a totally partisan one, the push for new limits is more likely to occur in states with Democratic governors and legislatures than in states in which the GOP controls the governor's mansion and legislature. Keeping in mind that 30 states have Republican governors and 26 state legislatures are GOP-controlled, compared with the 19 that are controlled by Democrats (four are split; Nebraska's is nonpartisan), it's obvious that the National Rifle Association and other gun rights advocates have a substantial firewall in the states. The firewall means that legislation in the states is likely to be only so effective, since — as has been seen in history — guns can easily make their way into states with strict restrictions from states with looser laws. In 1993, Virginia instituted a gun sale restriction that limited buyers to one handgun a month, after research found that a disturbing number of guns sold in the state were being used in crimes elsewhere on the East Coast. That restriction was repealed last year by the Republican-led Legislature and signed by GOP Gov. Robert McDonnell on the grounds that it interfered with the Second Amendment rights of citizens. The repeal, however, has once again raised fears that a flood of Virginia guns will find their way into the hands of criminals. Something else to keep in mind is that not every Democratic governor is a sure champion for tough new gun control laws. Take Gov. Jerry Brown of California who, in the past has described himself as a gun owner and hunter. Though Brown has signed gun control legislation during his governorship — for instance, a ban on openly carrying unloaded handguns in public — he has been relatively muted on the issue post-Newtown. He's made no promises on whether he would sign future gun-control bills. So while it should be fairly obvious that new restrictions on guns face significant obstacles in the nation's capital, it's just as true that such efforts face significant headwinds in most states, as well.